Click here for a tutorial on our Mushrooms using the Slurry technique. 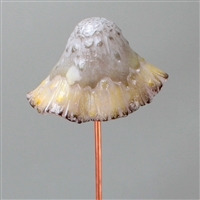 Click here for a tutorial on the GM209 Bell Mushroom Mold. 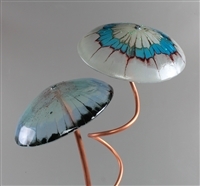 Click here for a tutorial on our LF156 Frit Casted Mushroom. Click here for a PDF tutorial on a reactive mushroom cap. GM226 Sm Center Drop Drape. Mold size: 3.25" dia. 1.25" t.
GM227 Small Five Ridge Drape. Mold size: 3" dia. 2.25"t.
Mold size: 4.5" dia. 1.25" t.
LF159 Mushroom with Dragonfly. Mold: 8.5" dia. Casting: 7"dia.. Fill weight: 400 grams.